For fume hoods that do not have an integral blower built-in to them, choosing the right blower is a significant decision. It’s the device that moves air through the fume hood and pushes contaminated air out from the hood, through ductwork, to the outside. 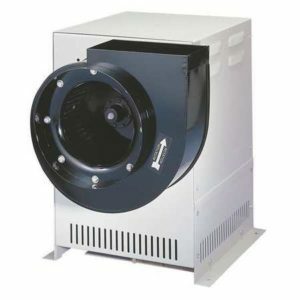 The blower must work in conjunction with the fume hood itself and the associated ductwork. 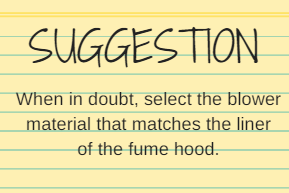 Consider the following when determining the right blower for your fume hood. What type of blower do I need? The type of blower is directly related to the intended use of the fume hood. 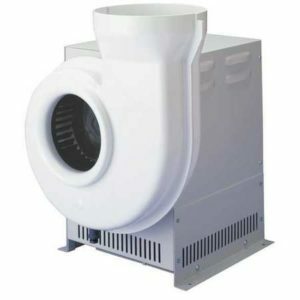 If the fume hood is used for venting non-toxic materials, an epoxy coated steel blower may be the best option. If the fume hood’s primary use is mixing acids, an acid-resistant blower made of PVC, polypropylene or fiberglass reinforced plastic may be the best option. Fiberglass for moderate to highly corrosive conditions. Coated Steel for low to moderately corrosive applications. PVC for perchloric acid and other corrosive applications. For volatile work, there are explosion proof and spark resistant blowers. These blowers are typically made of fiberglass and have an enclosed motor. This enclosure ensures that potential fumes in the air stream do not encounter an electrical spark or even the motor itself. The fan blades are also designed to be non-sparking. What size blower do I need? Finding the right size blower is critical to the performance of your fume hood. A blower that is too weak will not properly remove contaminated air. Likewise, a blower that is too strong could overpower the ductwork and create turbulence around equipment or containers. Each fume hood manufacturer will provide the amount of air needed to operate the fume hood, stated in cubic feet per minute (cfm). No measurement should be less than 75 cfm. This will ensure adequate airflow to prevent vapors from escaping when the sash is open. Further, all fume hoods and ductwork systems create static pressure. And this pressure is taken into account when determining the size of the blower. Such factors that should be considered are duct diameter, length of the ductwork, the number of elbows in the ductwork and the degree of the elbow bend (e.g. 90-degree elbow bends restrict airflow differently than 45-degree elbow bends). These factors, along with the corresponding sash height create static pressure and affect volumetric flow. After this information is compiled, and static pressure is known, it is much easier to determine the proper size blower for your fume hood. Choosing and properly sizing a blower can be a complex process. There are many factors involved and many details that play a role and ultimately impact the performance of the hood. To ensure that your fume hood will work properly, reach out to an expert to discuss your needs and determine a solution that will benefit your laboratory. And if your fume hood blower is broken, a replacement blower is an option. But it may be time for an upgrade: When is it Time to Upgrade Your Fume Hood?